“Gold prices are on a rally on the back of increasing geopolitical tensions, a weak dollar and prospects of a US rate hike becoming less imminent, providing a great opportunity for safe-haven and value-buying,” said organiser Expo Centre Sharjah at the time the show opened. “Besides, gold is also at its peak supply this year, which represents the highest level of gold production before its starts to fall, triggering a price rise as supply dwindles,” it added. With experts predicting a rise in gold prices, retailers and master jewellers taking part in the region’s most popular and longest-running jewellery fair expected good demand during its five-day run. Held under the patronage of HH Dr Sheikh Sultan Bin Mohammed Al Qassimi, Supreme Council Member and Ruler of Sharjah, the 38th MidEast Watch & Jewellery Show was opened by Sheikh Abdullah Bin Salim Al Qassimi, Deputy Ruler of Sharjah. Present were Abdullah bin Mohammed Al Owais, chairman, Sharjah Chamber of Commerce and Industry, Saif Mohammed Al Midfa, CEO, Expo Centre Sharjah, other officials, dignitaries and industry representatives. “Gold is getting back into its groove. After two straight years of losses, the prices are set to rise. Factors that will prop up prices include economic uncertainties, geopolitics, physical demand and dollar movement. Increasing purchases from central banks is another factor that will increase demand and send gold prices higher,” Al Midfa explained. At the time the show was held, the gold price was up more than 6 per cent. 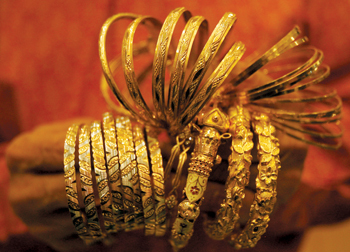 “Our region is one place where even gold jewellery, apart from bars and coins, is considered an investment option because of its intrinsic value, and the precious metal has historically been a very good way to store wealth,” said Al Midfa. The show catered to rising demand for luxury timepieces with the value of Swiss watches imported into the UAE rising 36 per cent since 2011. According to the Federation of the Swiss Watch Industry, the total value of Swiss watches imported into the UAE in 2103 was $1.05 billion.